Hartel, J. (2011). Information in the hobby of gourmet cooking: Four contexts. In W. Aspray, & B. Hayes (Eds. 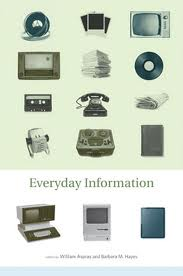 ), Everyday Information (pp. 217-248). Cambridge, MA: MIT Press. This chapter aims to characterize the information activities and information resources that underlie the hobby of gourmet cooking in America. Gourmet cooking has roots in French haute cuisine and is a manner of food preparation that entails high quality or exotic ingredients and advanced technical skills (Wilson 2003). It is featured today at many high end or “white tablecloth” restaurants, associated with cultural icon Julia Child, and has been adopted by millions of Americans as a hobby. Given its complexity to execute, gourmet cooking is information intensive and generates a vast multimedia information universe. Altogether, this hobby is a rich setting to study information phenomena in an everyday life and leisure context. For a decade I was an avid gourmet hobby cook, renown among family and friends for my decadent chocolate soufflé. When I entered a doctoral program in library and information science, I was unable to continue the hobby, but as an alternative I opted to do a dissertation (Hartel 2007) on its informational features, which had not been the subject of academic inquiry in my field. Taking an ethnographic approach, I conducted fieldwork between 2002-2006 by participating in gourmet cooking social groups, classes, online forums, public lectures and farmers markets in greater Los Angeles, California, a culinary nexus. Further, I interviewed 20 gourmet cooks in their homes to learn how they practiced the hobby and used its information resources. The participants lived in Los Angeles, California, and Boston, Massachusetts. My sampling strategy was purposive and opportunistic, and I found subjects through family and friends, or I approached potential informants at culinary-themed events such as cookbooks signings. I sought articulate, enthusiastic cooks with substantial experience in the hobby (at least two years), and I did not attempt to examine sociodemographic variables in this exploratory study (Stebbins 2001a). After the interview, each gourmet cook showed me their personal collections of culinary information in their home (focusing mainly on documentary items like cookbooks and recipes, and secondarily on multimedia and digital resources), which I photographed and diagrammed. I also studied popular and academic writings on gourmet cooking. Altogether, my data set amounted to several hundred pages of transcripts and fieldnotes, almost 500 photographs, and volumes of literature. I analyzed these materials for patterns and themes using grounded theory (Strauss and Corbin 1998) and NVivo software. The results took the form of a fieldnote-centered ethnography (Emerson, Fretz, and Shaw 1995) that showcased the actual statements of hobbyists (anonymized to protect their privacy). The chapter begins with an Introduction that includes a brief history of gourmet cooking, a vivid example of an actual hands-on episode, and theoretical concepts to specify gourmet cooking in its hobby form. Then, the information experiences and their associated information resources in the hobby are organized and characterized as four contexts: Livinga Gourmet Lifestyle, Expressing Culinary Expertise, Staying Informed and Inspired, and Launching a Cooking Episode.Throughout, tables summarize data and list culinary information resources. At the conclusion, there is a survey of Information Age innovations in the hobby.